Ephraim’s life is a little screwy. He comes home one day to find that his mom has attempted suicide after being forced to identify her only son’s body in the morgue. After getting her to the hospital he finds the belongings of this poor boy among her things. Assuming it’s a case of mistaken identity since he’s quite obviously alive, Ephraim is shocked to find that this dead boy had his library card—the one still in his wallet—among his possessions. And he has a strange quarter unlike any he’s ever seen. It turns out that this isn’t any old quarter. No way mama. This coin is magic. Ephraim finds that he can wish for anything and he gets it. New, non-suicidal mom? Check. His lifelong crush suddenly interested in him? Oh, check it. A hot date for his dorky BFF, Nathan? Check. That. Business. Off. The problem is that with each wish there seems to be a consequence, a chain reaction of sorts. In some ways, the coin is a huge gift–a way to make his life exactly as he always hoped it would be, but in other ways it’s a curse. Ephraim begins to wish he’d never found the coin. Every time he attempts to fix things, he makes more dramatic changes to his life and to the lives of those around him and he doesn’t know how to undo any of it. I really liked this premise. I can’t give too much away without really spoiling it, but trust me when I say that my description barely scratches the surface. This is not simply a story about a magic coin. This is truly sci-fi. There are so many twists and turns and every time you think Ephraim’s plan will set it straight, something goes awry. Not only that, but there are moral questions raised here. Ephraim is an essentially good guy. Sure, he wants his mega crush, Jenna, to like him–but otherwise he’s pretty honest. He suddenly has this cool power to grant wishes (as the coin only seems to work for him), both for himself and his loved ones…and yet should he go around changing people’s lives just because he can? Outside of Ephraim, I liked the female characters in this story, especially Jenna and Zoe, two girls Ephraim is undeniably drawn to. These are strong girls who are smart and who have more to them than meets the eye. They can definitely take care of themselves. There were a few points where I got confused because the scenes began to change rapidly, but otherwise I totally enjoyed this book. Meyers pulled together an interesting, unique story with tons of twists. The explanation for Ephraim’s “double” at the beginning of the book (the boy who died) was not at all what I thought it would be, and I loved that. It’s good to be surprised. 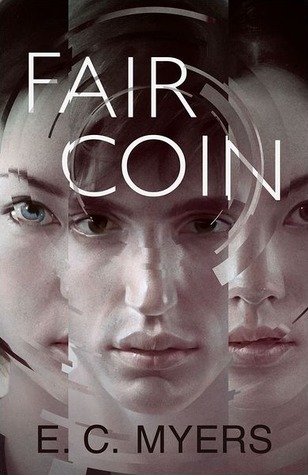 Thank you to Pyr Books for sending me a copy of Fair Coin in exchange for an honest review. It was a fun read! Very interesting sounding… I love the moral dilemma of wishes, or changing the natural course of events. Definitely makes for a good tale! I’ll have to add this one to the list! Yes, I’d love to hear what you think of it. Definitely worth a read. It was not at all what I expected.